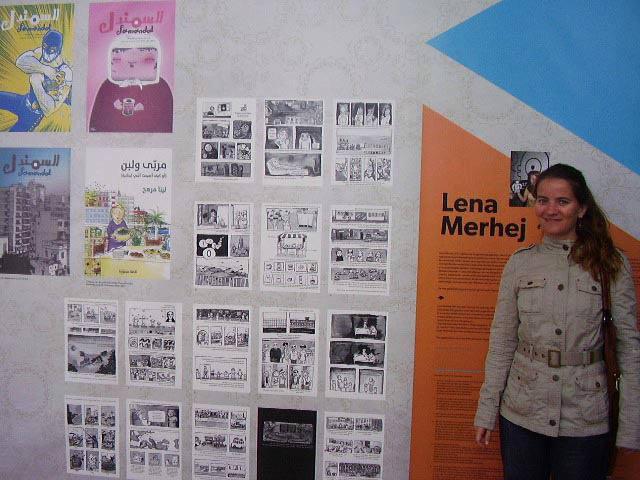 Lena Merhej is one of the founding members of the very active Lebanese comics magazine “Samandal”, the first publication of this kind to cross the borders of the Arabic world and reach the shores of Europe. 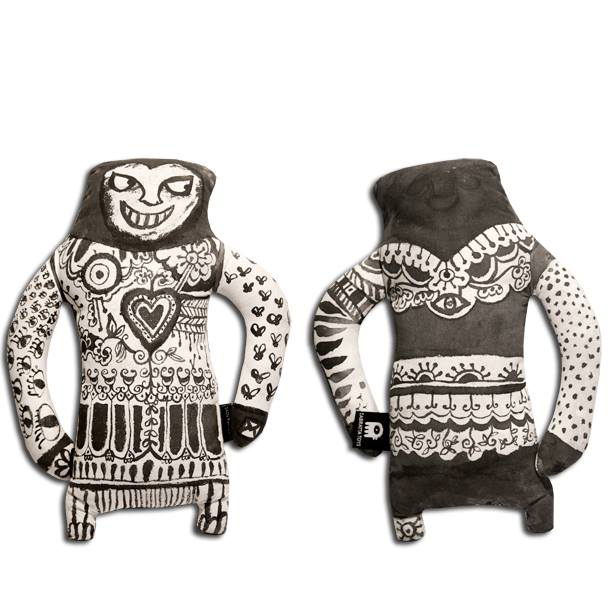 Since some time ago Lena lives in Berlin where she works as an illustrator, designer, cartoonist and curator. In this short interview we discussed some old and some new moments of her rich career. RP: Can you tell us, back in the beginning of your cartoonist career, what was the comics and graphic arts scene like in Beirut/Lebanon? LM: We started Samandal in 2007, but we've thought about it since 2004, back when comics were found mostly in children´s magazines. Zerooo magazine, a collective that published satirical comics in color was already finished by 2002, after barely 2 years of activity. After publishing a few of their comics in the 80s and the 90s, most of the Jad Workshop artists ended up doing animation for TV. Mazen Kerbaj was self publishing and selling his comics in a several art galleries. In 2004 I met a few animators and comic artists at an event I organized for the American University of Beirut. A few years later, Comics were revived, as were yearly festivals, following the old “tradition” which started in the middle of the war. Animated by the likes of Nadim Tarazi, Henry Mathews, Jad (Georges Khouri), Rita Moukarzel, and supported by the Academie des Beaux Arts and other cultural commissions in Lebanon, these festivals acted as an international exchange between artists, and offered a small exhibition; works from the local artists were buried under the huge collection of imported comics. Samandal had to come about in such a context; it was promising some exposure and people were happy to get together and work on common projects. We had some skills, we knew some artists and we wanted to make comics. RP: Things have changed a lot since then, it seems. How many issues has Samandal published so far; how many comics pages would that make in total? Who are some of the core authors/members of your collective? 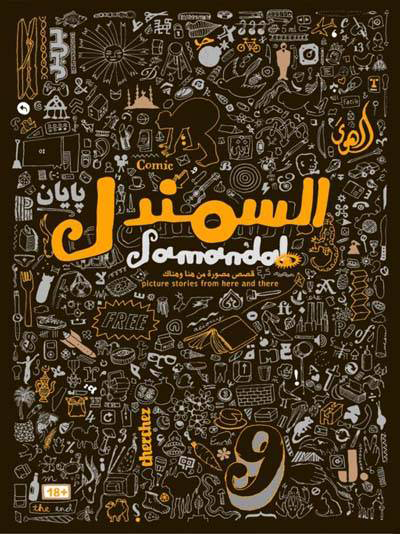 LM: There have been 15 issues of Samandal so far, and about 3000 pages of comics, in Arabic, English, French, and Spanish (I think mine also includes some German). Most of them are under CC, the first 3 issues are available online, and the first 6 issues have been translated. Originally the team consisted of Hatem Imam, Omar Khouri, myself and Tarek Nabaa - FDZ join us a bit later. 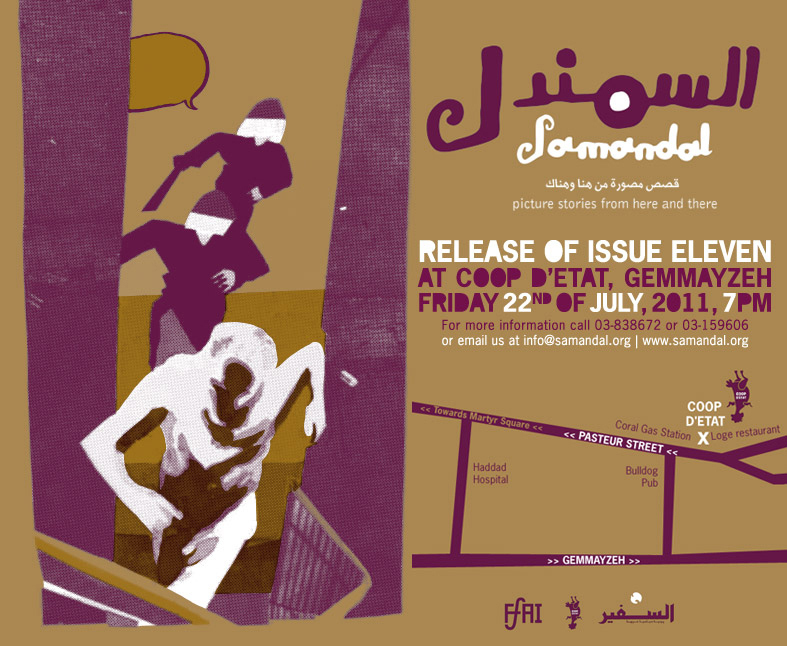 We did the editorial work, the publishing, fundraising, and organizing the events and the workshops of Samandal. Our translators were Nidal Abou Mrad, Sahar Mandour, and Lina Mounzer. A few years later, a whole new design team joined us, starting with May Ghaibeh, Maya Moumneh, Jana Traboulsi, and Ahmed Gharbieh. Barrack Rima joined us on the editorial team along with Ghadi Ghosn, Joseph Kai, Mazen Kerbaj and Anna Gabai. RP: Come to think of it, the first comics from the Arab world that we, or at least I have been able to see came from Lebanon. Was that thanks to your work and effort in promoting them, or is the general climate in Lebanon more open and accepting of such art forms, when compared to other countries in the region? LM: Like the old saying goes “Cairo writes, Beirut prints and Baghdad reads”; back in 2004 I have had already quite a bit of experience in publishing as did Hatem and FDZ. I worked hard on finding my voice in animation so I knew that I could tell stories. Samandal was not a very wild or free project as much as it provided a creative and expressive opportunity in an ever-changing environment. People were coming out and experiencing a new social life, that of the budding galleries, theatres, cinemas and book fairs that Beirut offered during the last reconstruction. We were a fresh team of graphic design students, illustrators and filmmaker wannabes, and we wanted to party. RP: You have some nice news to share with us, concerning your last appearance on FIBDA comics’ festival in Algiers. Risha Team joins with the sincere congratulations! LM: Yes! Thank you! I am really honored to win the prize of the best Arabic graphic novel, for the second time. I hope all my Arabic teachers hear about it! RP: How do you think the prize will influence the motivation among the authors in Lebanon? RP: At the moment, you live in Germany, but you're still working quite a bit for the Lebanese and the Arabic comics scene, as a curator mostly, at some key-festivals. Can you please introduce us to some of the authors whose work has impressed you lately? LM: I will mention publications that are not part of children´s magazines and speak about the great work that TokTok (http://www.toktokmag.com) are doing in Egypt by also publishing the 9th Art (http://www.9art.org/). There is also a new, quite subversive publication, Tahwila, (http://www.cspublishers.com/blog) which opens many political debates related to Arab countries. In Lebanon, La Furie des Glandeurs (http://lafuriedesglandeurs.blogspot.de) has shown some great work of various artists bound by common themes such as migration, foreign worker´s abuse or the plastic beach culture that we so much cherish on the coast of Lebanon. RP: Through this project we try to cross the cultural borders by connecting different art scenes, and often meet people among producers, managers and initiators, whose cultural identity transcends the borders of their country of origin - more often than not, these persons turn out to be the most valuable for the development of cultural scenes and their growth... Does this apply to you as well? And if it does, could you elaborate? LM: I am Lebanese German. In a way, I was born with deep contradictions but also with a good set of skills needed to adapt to new environment. I love to say this sentence as it brings fabulous bubbling cities together: "I grew up in Beirut, I studied in NY, and now I live in Berlin…" I also studied in Bremen, worked in Cairo and had short visits to several European and Arab countries to festivals and different work related activities. Met a lot of people and made lots of friends, I believe this to be the greatest asset. A few years ago while in Sophia, Bulgaria, I met an animation collective (http://compote-collective.com/) whose animated films closely resembled my own. I was thrilled to “find the other half” of my animation. People like that, the artists and the dreamers, make me believe that the world belongs to us because we could live anywhere. I am profiting from this nomadic life-style until further notice. Maybe I will go to Argentina next. RP: Besides Samandal, what other projects are you currently working on? LM: I am working on a project, a dissertation, which in practice mostly deals with words. I look at the narrative and how comics build it when the focus is shifted to war. Since everyone in Lebanon seems to have their own war story, why not try to put all these stories together and make an understanding of that. My research lead me to first understand and then analyze comics. I have designed a visual interface based on an analytical model, rather like an annotative system for comics content. Other than that, I am working on a new project for Samandal. We would like to harvest the bounty of experience and contacts accumulated over the years, and create a comic alliance that could benefit artists, publishers and distributors of comics across the Arab countries, as well as the international scene. We've already built an alliance with Egypt; we hope that some publishers in other countries will join too. The only condition is that we all join efforts and work together on creating, publishing and distributing comics. For the first step, we need some financial support that would allow us to join programs and make sustainable collaborative projects. RP: Relying on your opinion and experience, how would you define the relation between An Author/A Professional, when it comes to the work in graphic arts and design? LM: I have to admit that it's always been difficult for me to impose my voice as an author when faced with writers in the Lebanese children´s book industry. I was always perceived as an illustrator. Not only was I an artist, with its entire negative connotation, in Lebanon, but also a not-so-serious of an artist. Illustrators are storytellers as well; they tell stories with their images, which kind of makes them authors too. To me, art and design is something like the flip of a coin, like practice and theory, or love and hate.. And thankfully, comics also flip like that in many ways. RP: How do you see the future of European underground? LM: I can only talk about comics, and from my experience. There are comics’ networks that are below the radar of the mainstream media that continuously create talent, work and share ideas for various reasons and interests. People know people who know people. We all know each other in some way or another and we are engaged in some kind of creative exchange. I am thankful to all people who write and draw and share.